I do my sewing in a corner of the bedroom. The room is large enough to hold a bed, a desk, multiple chests of drawers, and two nightstands. It doesn’t feel too cramped. 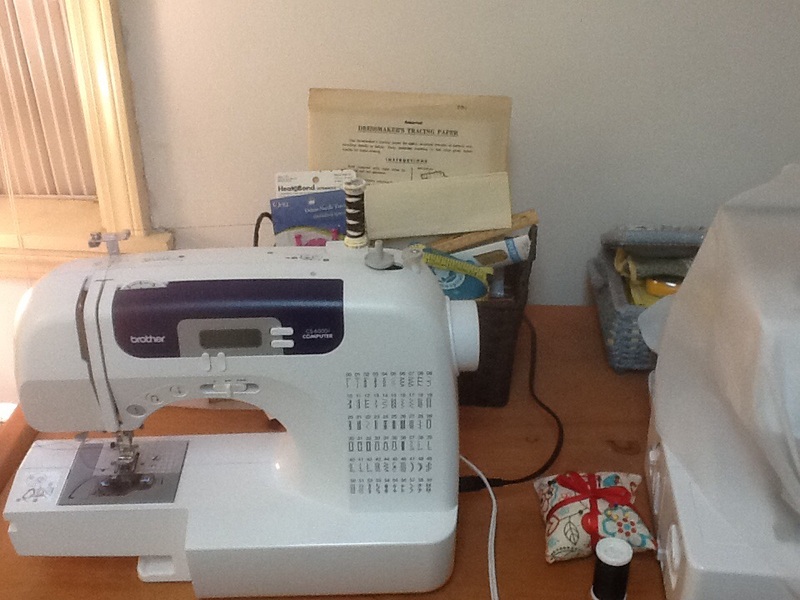 The sewing machine is on the desk, along with the serger (which I have not yet tried to use), a basket of rulers, shears, tracing/marking notions, and a sewing basket. I keep the sewing basket, which I bought at a garage sale, as it reminds me of one I played with as a child. I like my machine because it’s lightweight and it adjusts its settings based on what stitch I select. That takes a lot of guesswork out of it for me. I can also carry it places by myself, which is super important to me. Next to the desk, I keep a set of plastic drawers for notions and folded PDF patterns. On top of the drawers is a fabric-sided bin holding my regular patterns. It’s overflowing! I trace the majority of my patterns using a roll of medical office paper (which is translucent). Once I’m finished tracing, I put the tissue paper, instructions sheet, and pattern envelope into a gallon Ziploc bag. The traced pattern goes in the bag once I’m done with it. My fabric remnants and yardage go into an Ikea Expedit, which I actually bought before I started sewing. 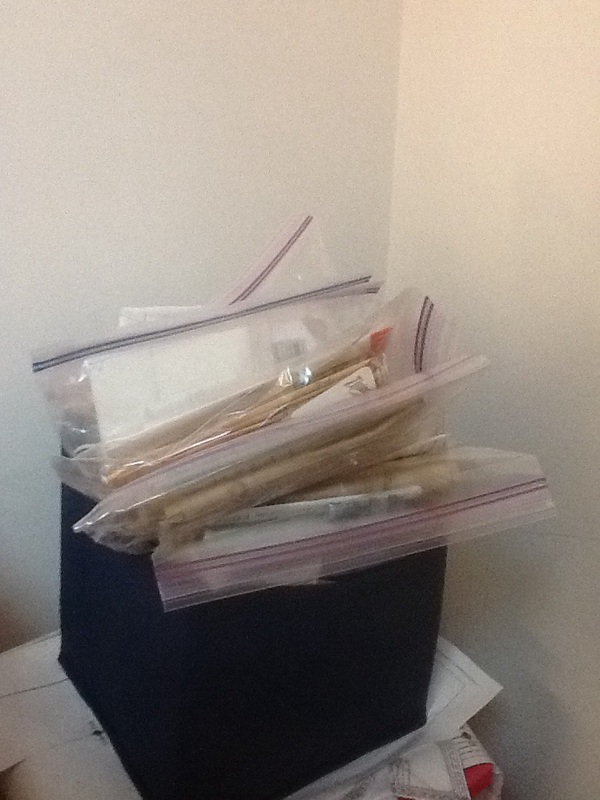 After I did a purging of my belongings when I last moved, I had more room for storage…lucky for me! I currently have a little too much to fit into the cubbies, so some of it is in the chest of drawers. (It’s stash diet time…) I don’t like the idea of keeping a huge stash; it seems like undue pressure for a hobby. I have enough to make maybe three dresses, two skirts, a pair of pants, and three shirts. The shirt yardage is with “practice” fabric that I got in Fabric Mart bundles. (No more bundles for me for a while. I should buy with purpose.) It seems like enough to me. I cut my fabric on a long folding table, which is between the sewing desk and the cubbies. It gets put away when it’s not in use. I use a giant cutting mat and a rotary cutter, as it’s easier on my hands. As a person who’s only been sewing for about a year and a half, I’m satisfied with my modest setup. When I’m an old lady living in a house with empty rooms, I’ll have a magical setup. At this point in my life, what I have will suffice. I’m also grateful for my boyfriend, who helped with setting all this up. 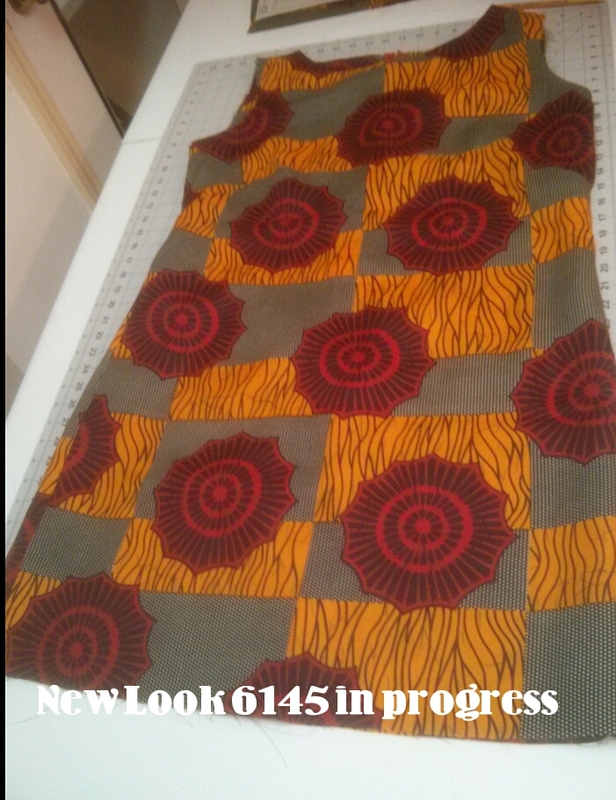 I started New Look 6145 the weekend of 2/7, tracing and cutting out the pattern pieces. I used African wax fabric that I bought in the New York Garment District last summer. (The purchase of this fabric was the first time I have successfully, accidentally, haggled a price. It’s a source of pride!) the fabric is light and crisp, even after a trip through the washer and drier. It is also a bit sheer. Edit: This is my progress, as of 2/17/15–side seams are sewn and finished (clean-finished), vent is finished and reinforced, and zipper is inserted (somewhat poorly, but I am not too fussed about it). Next up: sleeves and a hem! On Monday, I sewed the darts. This dress is different from Simplicity 1609 (another shift dress) in a few ways; one of those ways is that it lacks shoulder darts and another is that the angled darts are less dramatic than the French darts on S1609. It also has a back vent, which I am not sure is entirely necessary, since the dress seems to be rather short. On Friday, I worked on the facing. I had some cutting mishaps, so the facings are not entirely even, after seeing the to the back pieces, which were the ones I mis-cut. I decided to turn under the un-notched edge and sew to finish, rather than using the fake overlocking stitch to finish, as I usually do. I think it looks neater turned-under. On Saturday, I decided to do a lapped centered zipper, rather than the invisible zipper called for in the pattern. The decision was based on what was available in my collection of zippers; the only matching zipper I had in the correct length was a regular zipper. This was my second time doing a lapped zipper, so I found it pretty exciting. I mashed up Lladybird’s lapped zipper method with the Reader’s Digest method, since I’d already basted down the facing, according to the directions in the NL 6145 packet. This is my first garment with separate sleeve pieces that must be set in. I’m looking forward to this challenge! I settled on the 1970s as the decade whose style I wanted to explore. I wanted to find something relatively easy, but with a couple of added details that would allow me to try a new technique. I found Simplicity 5914, a shift-like dress with a collar and cuffs, along with a waist seam (unlike a true shift), which fit the bill. Image is from Etsy @AuntHoneysEstate/Google Image Search. I ordered the pattern in size 18.5 from eBay; I couldn’t find one in 18 or 16.5. My plan is to try to tissue fit the pattern, as it’s already cut in that size, or to trace the pieces slightly smaller. What should I do? I’m excited about learning how to do a collar and cuffs. I plan on starting a practice run of this dress this weekend. 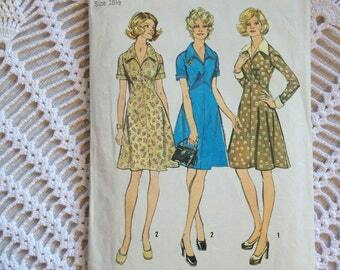 I wonder why Simplicity doesn’t print patterns in half-sizes anymore?